Alternating Pressure Mattress Made Specially for People with TSCI / Spinal Cord Injury. Traumatic spinal cord injury (TSCI) is a substantial cause of impairment, with serious physical, functional and emotional repercussions. While TSCI will not exclusively compromise the life of the person after the occurrence, the reduction in functional independence has the greatest impact on a lot of people. The TSCI patient requires additional attention and care. Often it’s the immediate family that willingly accepts the role of a healthcare provider. However, many TSCI patients desire to be self-reliant to control their own comfort or even to participate in their care process which includes preventing pressure ulcers. For most TSCI patients, Skin protection is achieved by using an alternating pressure mattress with low air loss. While though very efficient at skin protection, these systems need a care giver to regulate the standard or basic functions of system including patient comfort. For independent people with spinal cord injuries, this implies that they must count on others to control their comfort. You can find recent advancements and innovations in skin protection support that addresses this need for those independent people who have spinal cord injuries. Based on request of an agency that provides medical services to those injured in action, Blue Chip Medical Products developed an alternating pressure with low air loss mattress system that features a hand held remote. The Tradewind-ATS-RC with remote control is simply perfect for any independent person who has been debilitated by a traumatic spinal cord injury or condition that affects their mobility. The Tradewind-ATS-RC Alternating Pressure Mattress with Low Air Loss provides a maximum in skin protection while providing people who have TSCI, traumatic spinal cord injuries to regain control of their comfort and independence 24/7 without the need of a care giver. 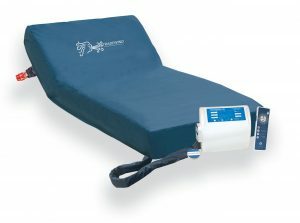 These remote functions allows independence and control of the therapeutic sleep surface 24 hours and day 7 days a week. Available in 35”, 42” & 48” and models to support up to 750 lbs. For more information regarding the Tradewind ATS-RC. Blue Chip Medical Products Inc. is a manufacturer of a full line of therapeutic mattresses, seating and positioning products and more. Blue Chip Medical’s manufacturing facility is located in upstate New York. Their products utilize the highest quality medical materials sourced in the USA.